Elizabeth's reign from 1558 to 1603 is considered by many to be a Golden Age, but there were many dangers present throughout her life. When Elizabeth was two years old, her mother, Anne Boleyn, was beheaded by her father, Henry VIII, and the young princess was then brought up in the care of governesses and tutors at Hatfield House. Her life came under threat when her half-sister, Mary I, became queen of England in 1553. Mary was determined to re-establish Catholicism in her realm, and viewed the Protestant Elizabeth as a direct threat, briefly imprisoning her in the Tower of London. When Elizabeth succeeded to the throne in 1558, one of her priorities was to return England to the Protestant faith and, between 1559 and 1563, she introduced the acts that made up the Church Settlement. The Catholic threat continued throughout Elizabeth's reign and a number of plots to overthrow her, such as the Northern Uprising of 1569 and the Ridolfi Plot of 1571, were narrowly averted. The biggest danger, however, came from Mary, Queen of Scots who arrived in England in 1568 and was promptly imprisoned by Elizabeth. Mary, a Catholic with a strong claim to the English throne, became the obvious focus for Catholic plotters and remained a prisoner for almost 20 years. Finally Francis Walsingham, Elizabeth's spymaster, obtained proof of Mary's plots to overthrow the queen, and Mary was executed in 1587. Elizabeth, torn between her own safety and the horror of executing a fellow queen, was inconsolable. The ill-fated Spanish Armada was launched by Philip II of Spain the following year, bringing to a climax the threat that had been posed to English independence from Spain for many years. Always a popular monarch, and a brilliant public speaker, Elizabeth's speech to the troops at Tilbury succeeded in uniting the country against a common enemy and confirmed the loyalty and adoration of her people. Despite pressure from her Council, particularly chief secretary, William Cecil, Elizabeth always refused to marry. She had a close relationship with Robert Dudley, Earl of Leicester, and was not averse to using the promise of marriage for diplomatic purposes, although she remained independent. She died in 1603 and was much mourned. 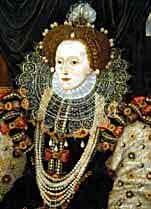 Her greatest legacy was to have secured the Protestant faith in England, avoiding bloodshed. James, son of Mary, Queen of Scots, succeeded her. Her father, Henry VIII, desperate for a son, did not attend her christening. Elizabeth and Mary Queen of Scots never met. Elizabeth struggled to subdue Ireland. In 1601 the Spanish sent thousands to support the Irish, who were finally defeated at the Battle of Kinsale. Her network of spies, orchestrated by Walsingham, successfully protected her from the very real threat of assassination.